Providing a perfect backdrop for a true southern celebration, The Folmar is also home to a newly added, enclosed roadside chapel with an open-air-covered pavilion, conveniently located right beside it. Embraced by nature, a sprawling Oak Ceremony Tree provides a shaded outdoor locale and another optional area to recite your vows. With the quintessential East Texas piney woods serving as your wedding’s backdrop, the true heart of The Folmar will be the memories of the love story you leave behind. In the heart of Tyler, The Folmar is built on 20 acres that offers respite and serenity among its rolling hills. Among its property sits a charming, 800 square-foot roadside chapel built to offer an enchanting ceremony option for the bride and groom’s big day. Its light and airy, romantic antique aesthetic is topped off with a steeple church bell—a ringing announcement to guests of the I Dos just spoken. The chapel’s imaginative design also includes beautiful French doors flanking either side of the aisle to let the outdoors in; ceiling fans hanging from above to keep guests cool; and a magnificent chandelier sparkling against the backdrop of the chapel’s stained glass window pane. The sanctuary’s breathtaking focal points provide the perfect place to say those solemn vows or renew old ones! Its open-air capability situates 60-70 guests or can accommodate overflow by simply opening up the French doors. If a wedding isn’t in the plans, but an impending life event is, the roadside chapel also offers you a calming, spiritual site to share any special day with your near and dear. Like a story book come to life an old Oak Ceremony Tree offers the bride-to-be another site to live out her fairytale wedding. Guests can witness the magical affair seated comfortably on white vintage oak church pews. Like Mother Nature presiding over the happy couple’s vows, the billowing Oak’s magical beauty is where any bride would want to marry her Prince Charming. The tree was originally envisioned as a dreamlike setting for any couple’s big day, but it’s also the perfect backdrop for your engagement and bridal photos, or even, a beautiful setting for senior portraits. The heart of the property is The Folmars’ once-private residence, now known as The Farm House, which is a trinket of a home, renovated and reserved as the bride’s quarters. The venue is a 2-bedroom and 2-bath farmhouse with a fully equipped kitchen perfect for caterers. A naturally lit hospitality room with vintage seating to greet guests is an ideal location for bridal or engagement portraits. The house also boasts a separate bride’s dressing quarters with her own hair and makeup station; and dress-fitting platform area; a separate bride’s maids dressing quarters with hair and makeup stations; and a family and friends lounge with comfortable seating and entertainment center. The Southern charm is further punctuated by the home’s full-length front porch adorned with sparkling chandeliers and simple, whimsical, appeal… it’s a nostalgic setting to host a rehearsal dinner; or for guests to mingle during cocktail hour; or even a wonderful space to host a corporate dinner or fundraising luncheon. The property is also home to Adam’s House—a manly enclave carefully re-purposed for the groom and his groomsmen the day of the wedding. A corrugated tin ceiling draped in a hand-painted American flag, nostalgically, defines this space’s overall masculine appeal. Aside from its patriotic and rustic aesthetic, the cave is also equipped to house everything your beloved groomsmen need to make the big day memorable, including: a bar, dressing quarters, gaming area with a ping pong table, poker table and entertainment center. If a bachelor party isn’t in the cards, then this space’s versatility may lend itself perfectly to host a poker tournament, fundraising party or even a friend’s birthday extravaganza! I Dos have been spoken and the champagne has been poured. Conveniently located beside the chapel, guests are just steps away from enjoying the rest of the fun sheltered from the elements for that reception, graduation or any memorable outdoor celebration. Conveniently located between the roadside chapel, the covered outdoor pavilion and the outdoor Oak Ceremony tree; and just adjacent to the Party Barn, Adam’s House and The Farm House; is a fully wired, enchanting courtyard. Its carefully manicured landscapes and the natural woodland area it’s nestled upon further enhance the dream-like scenery. This outdoor setting provides a wonderful area to mix and mingle with wedding guests or it could even serve as a gathering spot for an intimate music benefit or private fundraising effort. The Party Barn is just that… an old, 600-square-foot, rustic red barn renovated to set the stage for cocktail hour and any food and beverage you would like your guests to sip and sample during the event. This is also the perfect setting for your cake and a photo booth. Additionally, situated right beside The Party Barn is an outdoor stage for your guests and/or DJ to take over the mic. The multi-purpose barn is the ideal location to host a bachelor or bachelorette party, any birthday party, graduation celebration or corporate event. 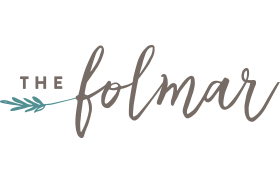 "I knew the minute I got to the The Folmar, it was where I wanted to get married." ~ Kelly D.
Once owned by the sweet couple whose 60 years of marriage inspired the venue’s name, The Folmars lived out half of their years through its doors. With their love as The Folmar’s muse, brides will instantly be lured into the property’s storybook appeal; a setting where live oak trees sprinkle the venue’s rolling landscape and birds sit perched on branches tweeting testaments of the surrounding beauty.